Parsec: Who are you? Who am I talking with? Ultrasyd: I'm a cat lover and curry eater... nah, damn, that question is hard. Let's try this one: "My nickname is Ultrasyd, I'm a member of brainstorm." Parsec: Ah. Ultrasyd... but you're also Sydney, right? Who are you, really? Are you a Sydney who likes to disguise as Ultrasyd? Or are you Ultrasyd who also has exigences of disguising among common people as a Sydney? Ultrasyd: Haha. I'm Sydney, a french guy. I'm married and I have a kid and, sometimes, I disguise as Ultrasyd. Parsec: There's nothing wrong with a little cosplay from time to time. Parsec: How much has Ultrasyd contributed to improve Sydney's life? Parsec: So it contributed a great deal, actually. Ultrasyd: Yep ... Without my wife and my son, my life would be crappy. But without demoscene and chiptunes, it would be crappy too. Seriously, I think I have almost no friends outside demoscene and chiptunes scene.... Excepted some old friends I met during my studies, maybe. Isn't it wonderful? Parsec: Yes but... this is slowly shifting the balance toward the "I'm more Ultrasyd than Sydney." Ultrasyd: Haha, maybe! Yes, you are right. Parsec: So, I assume it's reasonable to ask you how much has Sydney contributed to Ultrasyd's music. Parsec: You mentioned "dubstep". Most of your tracks do have a dubstep influence... and at the same time, you speak about it as if shaded by a faint sense of guilt. Parsec: I do like it... and you do too or you wouldn't make dubsteppish tracks... how comes that such a popular style is surrounded by this shroud of suspiciousness? Ultrasyd: I really have no idea. If I like it, it's fine to me, whether it's popular or not. But honestly, I don't know much about dubstep. I have a big folder called "UFK" that I never listen to, because everything sounds the same. 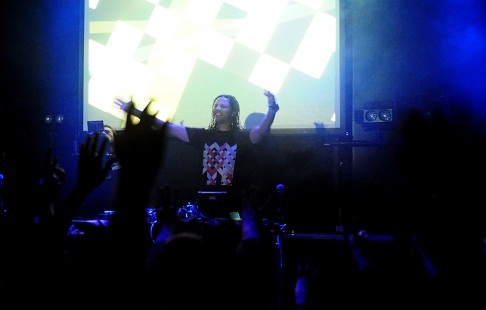 Then I know 2 tracks by Skrillex, and I have 2 albums by this awesome guy called Savant, that's all. 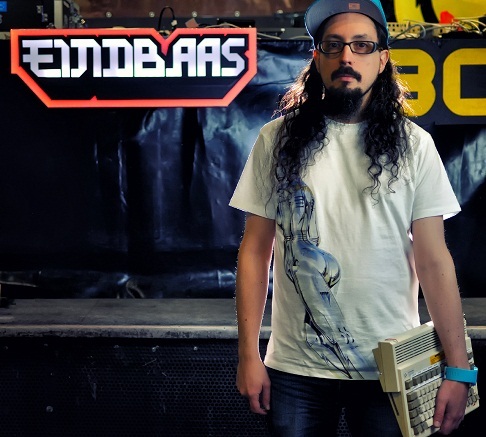 If there is some dubstep influence in me, it comes from the chiptune and 8bit music scene. Parsec: So you started listening to demoscene related music and you decided to tag along? Is it then that you decided you wanted to give musicmaking a try? Ultrasyd: Oh no, I've always wanted to make music. I discovered Fast-tracker 2 around 1996. That was totally unexpected, an accident. There was no internet back in the 90's (at least for me) so I got some samples on a CD with a magazine about computers and games (Joystick magazine). It's only during my studies, where I could connect to internet at the bilbiotheque, that I discovered the demoscene. Mainly from little cracktros with chiptunes. Names like Maktone, Fairlight, Razor 1911, Myths that lead me to ask google about those names, and I discovered orange juice, pouet.net and nectarine demoscene radio. Parsec: That's how you got involved with the demoscene? How was Ultrasyd born? Ultrasyd: I had no awareness about the demsocene, before. With my first computer, an Amstrad CPC I kept until 1995, I gave a try at pixel art and music (programming in basic) until, in the 90's, I realized “those guys” were using the same tool I was using: Fast-tracker 2... So I uploaded a bit of my old work, but it wasn't very good and I kept on lurking. 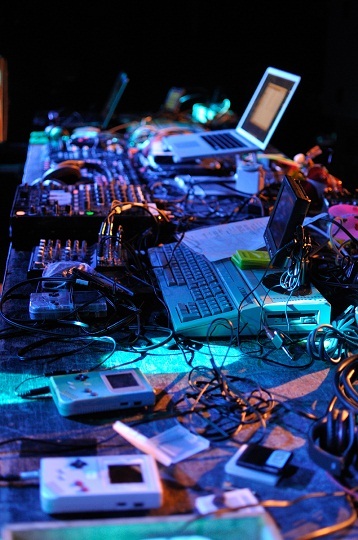 After that, I discovered Reason, and produced a bit of metal and electronic music. I tried some xm chip around 2001, cracktro style. But it's only when I started a collection of retrogaming devices that I realized it was possible to make the kind of music I listened to on nectarine radio. That was actually the real beginning of the Ultrasyd project. Parsec: So you are actually experienced with music making... a slow progression toward excellence like most computer musicians out there. It's not like you grabbed a copy of Renoise and BLAM, there you have Ultrasyd all of a sudden, right? Because that could be really really hurtfull for other musicians, are you aware of that? Ultrasyd: I just try to make something original. Bits of chip in a tune made with renoise, or some funkyness mixed with electro. Maybe it's just the good thing at the right time, and a lot of luck. Ultrasyd: Well, I just upload my music, it's not released within a proper album or with any real advertising. We have some nice tools now (Soundcloud, facebook, online radios), and I'm very thankfull and lucky to have people sharing my tracks. Ultrasyd: Ah, I also need to apologyze for winning those compos where you also partecipated... That must have been an error. No living musician can match the beauty of your compositions. Parsec: You're too kind, Ultrasyd. Thanks, I do appreciate. Ultrasyd: Hey! I never really said that, you're just inventing now! Parsec: Ushhh... that's... irrelevant, really, I'd rather discuss the fact you seem to think your popularity is just a lucky strike. Parsec: So you're not just telling me you're not really good... but you also aren't popular? Parsec: Usually, as far as I know, when you're not producing much... not having too many concerts... and still having your music shared all over the globe despite the lack of proper marketing strategies... well, that is called "quality" or "talent", are you aware of that? If your music is excellent then it will reach everyone and create the kind of consequences you're describing. Now... according to reverse psychology, if I call you "a lame excuse for a musician" will you become aware of how damn good you are? Ultrasyd: Haha, I don't know ... Maybe a bit of natural talent, to know what might sound good or not. The only ambition I have is to make an atari sound as powerful as a DAW, and that's a technical ambition. For the rest, I should probably hire someone to start a strategy but the thing is that I like the demoscene spirit: free, no money. Once you start promoting a lot, then there is money, pressure, and things are different. Parsec: You "simply" can tell good sound from bad sound? You make it look like this was a minor feature... but I don't think anyone makes music thinking "Let's deliberately do something that sounds bad"... not even Starpilot or Ankhangel. Just sayin'. Anyway. Is the Ultrasyd project going somewhere? What are your expectations? Ultrasyd: If I could travel a bit more and make more friends here and there, then it would be perfect. But I'm aware that I'm not producing and promoting enough, even for a small, non-commercial project. I should maybe try to get some more booking, but so far I've just received propositions and I don't even dare asking to play. At least I should release some real album... I'm seriously thinking about that. This year, if I'm not too lazy. Parsec: An old question which seems in topic: what is the most universal of human features? Fear? Or lazyness? Ultrasyd: Lazyness! Of course lazyness. I think creativity is something that makes us humans... but everything seems made to distract us. The process of creation, focusing on doing is always, somehow, a fight against yourself, more or less. Parsec: Is it? A fight against lazyness? Ultrasyd: Yeah, a fight against the lazy you. But creating makes you feel alive. Getting bored could be the second most universal trouble right after lazyness. Also, other people perceive you through your work. Without the others, you don't feel alive... huh, that's complicated now :D Philosophy! Parsec: Yes yes, I know, it's compulsive and I always end up around there. Philosophy... which basically is the attempt at understanding reality through logic... so I never understood why would anyone create a special class for this kind of activity in the first place. But anyway. That's about lazyness... what about fears? Ultrasyd: fear of the blank pattern or blank screen can be a big issue. Sometimes lazyness can even be a way to refuse your fear of the white page, btw! Parsec: So you see, we're always orbiting around the fear-lazyness twin concepts. Ultrasyd: Damn, you're right. Again. You always are. How can you be so smart and wise? Ultrasyd: Now you're inventing! Again!? I never said that! What kind of interview is this? Parsec: *cough... Tell us, I heard you work with animals? A lot of my friends do the same but you deal with real animals, right? It's not a metaphore. Ultrasyd: Yes. For a living, I'm a vet. I take care of dogs, cats, and small animals like rabbits, rodents, reptiles and birds. More specificly, I work in surgery now. Parsec: What does a day in Sydney's life looks like? Ultrasyd: A day in my life ? I wake up early (you can't stay long at bed with a 3 y.o. kid) then either I have to work at the clinic or, if I stay at home, I start with house works. An ordered and clean environment is mandatory for a clear mind. Then I spend a lot of time playing with my son. Parsec: You take care of your family, your house, other living beings. Touching. What is it you do for your own fun? 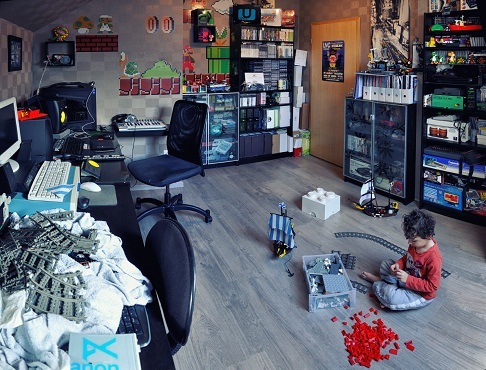 Ultrasyd: I'm a big fan of lego toys. That's what I'm doing right now, and I've just ordered some hundreds of bricks. I'm also fond of reading. I also like taking photos. Indeed I'd like to to give a try to portrait photography, why not outside of my family... So I'm reading a lot about that. And music, of course... but I only compose when my son is sleeping, when I'm alone at home, or mostly at night. Else, it's difficult to focus. Sadly, I tend to be interested in many new things, that I either quickly develop as a passion... or I confine in a corner of my mind, just like building legos or photography or anything preventing me from making music. We all need 48h a day, right ? Parsec: If not more, possibly. Anyway... your attitude toward clean environments, clear minds, little fluffy cats saved by brave vets, loving your family, educating yourself and being overall a great person who humbly radiates wisdom... has just horribly annoyed me and our readers. Can't you fix this by sharing something politically incorrect about you? Do you practice surgery as a recreational act? Do you secretly wear baby seal leather boots? Do you steal heroin from the clinic's stash? Parsec: Oh, c'mon. You are SO vanilla... that's all you've got? Ultrasyd: hmm... Pink lingerie and baby seal leather boots? Parsec: No, really... You are strange. Not only you are an excellent musician but you're also a kind and pretty decent person. A recent study (infact I invented it right a few seconds ago) shows that most sofasceners will be scared by all this and will try to catch breath and compensate by watching Variform2. Those unable to find it and watch it within 2 hours after reading this... will fall into apathy, they'll slowly morph into pink amoebas and will end up drawing magic ponies with Knoeki. I hope you will work on this. You should look at people from above, with a patronizing attitude, like many other sceners do. But anyway... do you feel like saying anything to our readers now that this chat is rapidly reaching its conclusion? Ultrasyd: Yes. Greetings to all the demosceners, keep up the good job! I like to think that, in our world, there is still some place where money doesn't work. It's amazing to see what friendship and passion can create. Parsec: That's terrible. Thanks for sharing your time with us, anyway. Ultrasyd: Thank you. It was an honor, you're awesome, Parsec. I mean it. Parsec: Thanks Syd, very kind of you. Ultrasyd: You're deliberately inventing parts of this interview.